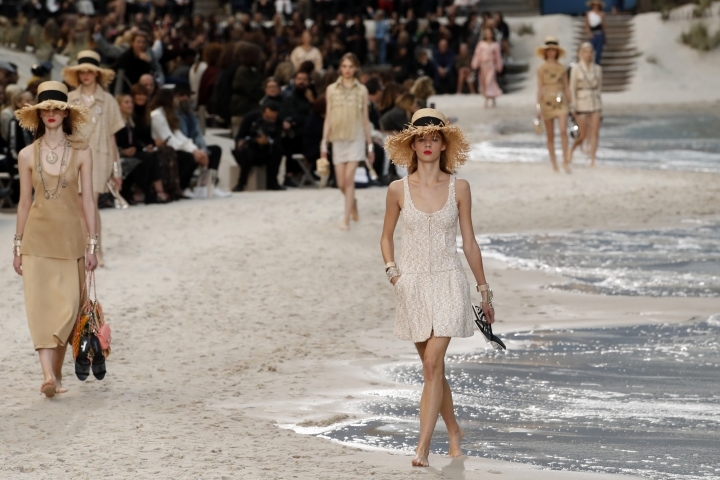 PARIS — An autumnal chill is in the air in Paris, but Karl Lagerfeld managed to spirit the Paris Fashion Week crowd away to an idyllic beachscape on Tuesday, the last day of the ready-to-wear shows. 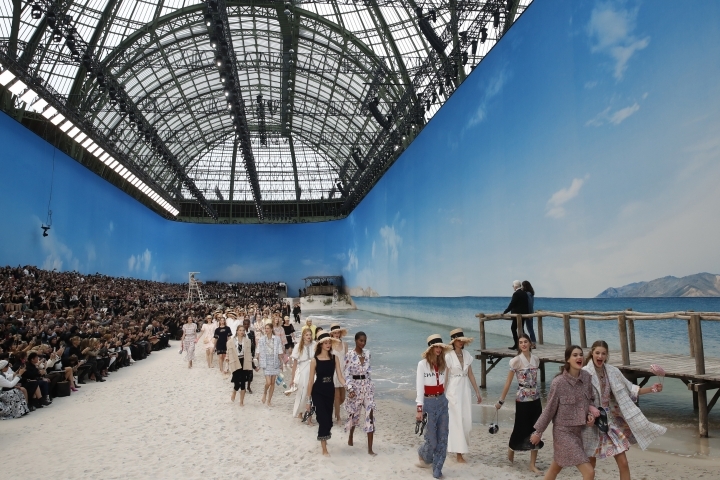 With a click of his gloved fingers, Chanel's eccentric couturier transformed the inside of the Grand Palais into a sunny Saint Tropez beach for his celebrity-filled spring-summer runway display. A real sandy beach and wooden huts awaited surprised guests, as water lapped a shore in frothy waves. 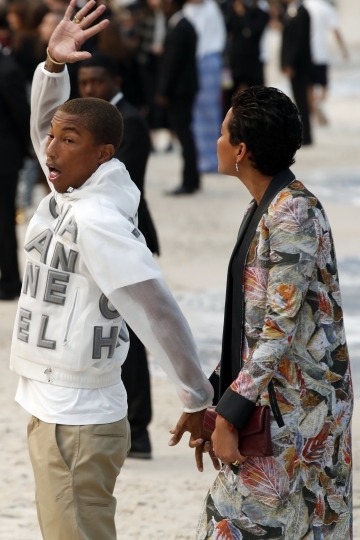 At Chanel's show, Pharrell Williams laughed as he pulled his wife Helen Lasichanh across the life-size beach to their seats, while model Ines de la Fressange exclaimed: "Shall we go for a swim?" as she wandered amid the scene. 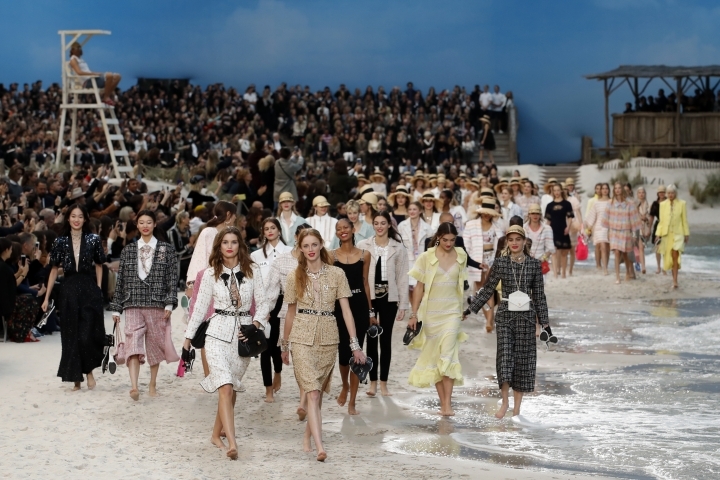 For the 15-minute show, Chanel whisked fashion insiders far away from the bustle of the nearby Champs-Elysees. Slack-jawed VIP guests, fatigued from nine days of back-to-back urban runway displays, marveled in near-relief at the expanse of water and masses of golden sand inside the lofty venue. The water touched an immense trompe l'oeil photo backdrop of a sea-view, complete with distant mountains and clouds speckling the sky. 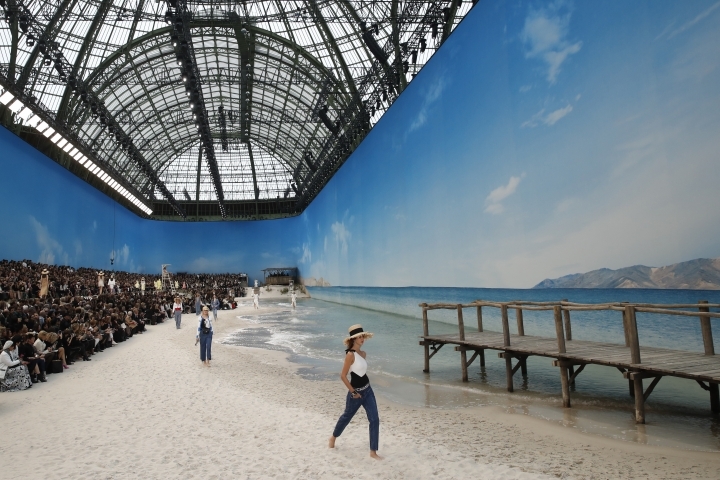 A tropical hut led to a wooden walkway from which Lagerfeld, 85, waved. Model Brad Kroenig sat in a tall lifeguard hut placed among the seated guests — though the only "danger" at the scene was perhaps a bustling scrum that surrounded Pamela Anderson. She posed for cameras in a soft white Chanel coat, pearl encrusted skirt and shades as the water lapped at her heels. The 51-year-old former "Baywatch" star — who's participating in the French version of "Dancing with the Stars" — acknowledged being somewhat surprised on receiving an invite to the chicest of the Paris Fashion Week displays. "I was wondering: Why is Karl looking for me? Why does he want me at the show?" she asked playfully, looking around. "And now I realize, OK, OK. We're at the beach." She said "I need more" Chanel bathing suits. Barefoot models, some wearing straw black-ribbon hats, held their heels and waterproof sandals in their hands as they paraded 82 outfits across the sandy runway. Instead of bathing suits, the models wore the house's signature tweed skirt suits in the soft, pastel colors of the warmer months. 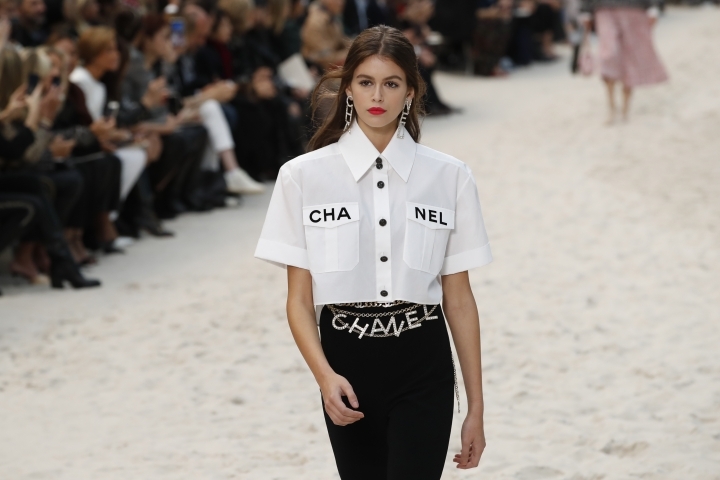 This was, after all, Lagerfeld's answer to "Baywatch" — even at the sweltering beach, the fashion-conscious Chanel aficionado should never let the style guard down. The spring-summer 2019 silhouette was a top-heavy one in a sort of mushroom shape. It was also ever so slightly geometric. Oversize embellished tweed coats sported big round shoulders and exaggerated tubular arms, while black cropped pants and leggings added a relaxed vibe. 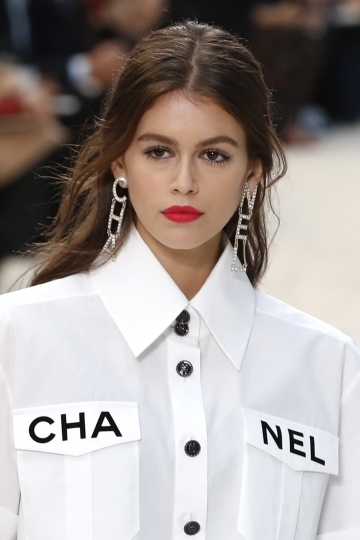 So too did a beautifully-shaped square, white shirt worn by model-of-the-minute Kaia Gerber, Cindy Crawford's 17-year-old daughter. 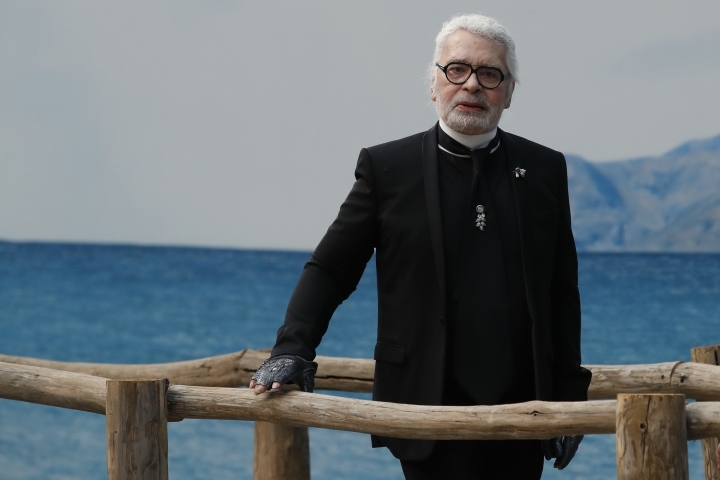 Lagerfeld, an octogenarian who has lost none of his zest for life, clearly enjoyed playing with the beach theme in the looks. A print of a parasol in the sun was used in silk foulards and loose, diaphanous fluttery silk dresses adorned with a bejeweled necklace that spelled "CHANEL." Gargantuan sculptured lettering (which guests eventually worked out to be variations of "M," ''I" and "U'') hung from the ceiling at Miu Miu's spring offering, placed in different orders, sizes and shapes. If it were a visual metaphor about learning to write or spell as your get older, it might be said that Miuccia Prada's little sister label grew up a bit this season. The fun motifs were still there, of course. Take, for instance, the giant yellow flower print that adorned a gown with funkily contrasting neon-blue heels. But tailored jackets, croc-style coats with big lapels — and significantly fewer kookily-contrasting colored ensembles — meant that spring-summer felt like a sexier and more sophisticated affair. An alluringly-ruffled cinch-waisted midnight gown sported an arty, three-dimensional floral adornment on the chest. Down its skirt was a sort of diagonal stitching that gave it movement — a detail that recurred with subtlety on many of the looks with beautiful effect. Silk scarves and dark knee high socks, meanwhile, added a touch of elegance. In the tussle of the best front row, Miu Miu boasted a roll-call of top names such as American actresses Kate Mara, Julia Garner and Juliette Lewis. VIP guests including Cate Blanchett, Alicia Vikander and Luke Evans gathered in oblong, space-age glass atriums that snaked inside the historic Louvre palace. They sat amid the glare of futuristic neon tubes marked out the Louis Vuitton runway. Outside, the water of a still Louvre fountain glistened eerily. Could it have been a vision of a lake on a distant planet or moon? This season, designer Nicolas Ghesquiere married the future to the past in an accomplished display that wove seamlessly in and out of previous and future centuries. The first look typified the time-traveling vibe. An oversize 1980s coat in blue and multicolor glistened with a space-age sheen. Yet, its sleeves were comprised of multitudinous layers, harking to the baroque styles of the 1680s. Voluminous long 1980s' hair was swept to one side in one instance, but alongside the dramatic puff-sleeves in the look, the hairstyle simultaneously evoked the wild hair of aristocratic men in the 1700s. It harked back in time. Silhouette-wise, this spring Vuitton collection was all about the sleeve. Long historic white ruffled sleeves were given futuristic rings of banding, alongside sparkling 1980s high pants with blue cartoon print. Traditional diagonally-shaped Asiatic sleeves also sported these rings of banding to produce a sublime diamond-shaped silhouette.